Since leaving Standing Rock on November 25th, I have been glued to my phone, watching minute-by-minute updates on the efforts to stop the Dakota Access Pipeline. Today, December 4, I pulled up Indigenous Environmental Network’s live feed to see Kandi Mossett in tears and my heart started to sink. I thought, “Oh god, what happened now?” I soon figured out that they were tears of joy about the breaking news that the Army Corps of Engineers has denied the permit for the Dakota Access Pipeline to go under the Missouri river. While not a complete halt to the project, the statement says that the US Army Corps will conduct an Environmental Impact Statement on the river crossing and explore possibilities for alternative routes, and it is thus a major suspension. I wept with relief and joy as I processed the news. After frustration and disgust at the many injustices that led to the standoff, finally, there is a win for the indigenous people, the environment, and truthfully, all of us. The fight against the Dakota Access Pipeline at Standing Rock became personal when my husband Jim and I transformed our righteous indignation from reading social media reports to something more productive: a plan to go to Standing Rock to support the water protectors’ efforts. While Jim could dedicate up to a month of time, I only could go for a week over the Thanksgiving holiday. We began gathering our winter gear and planning logistics. On Saturday November 19th, we hit the road from the San Francisco Bay Area. 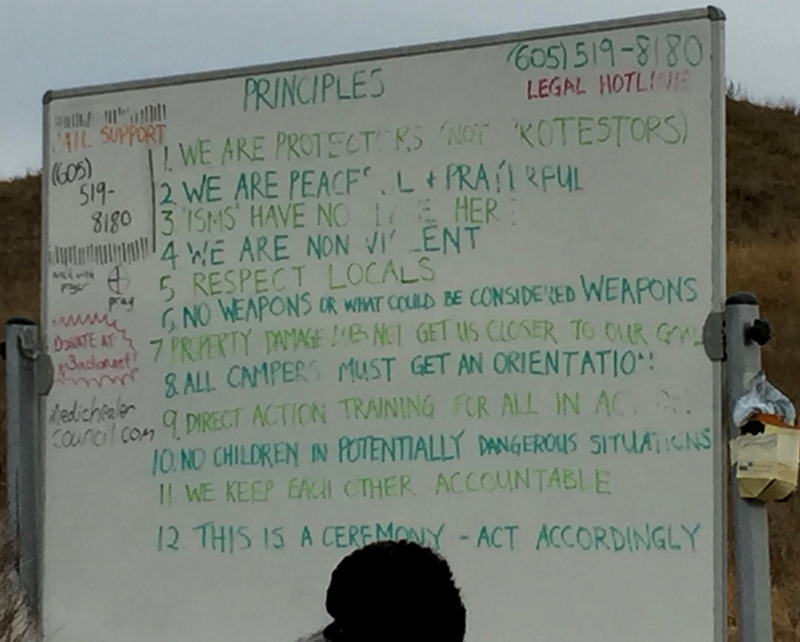 On Sunday Nov 20th, we were in a hotel in Spearfish, South Dakota and watched Kevin Gilbertt’s live footage of militarized police shooting rubber bullets and water cannons at unarmed, peaceful protesters in 26-degree weather. We were horrified, and scared — for all the water protectors, and for what we might be facing ourselves. The next morning, we turned into the gates of the main camp, Oceti Sakowin, with a surprising sense of wonder and excitement. The prayerful, peaceful nature of the camp was palpable, even on the morning after such intense violence. I was awe-struck by the level of organization and collaboration in the camp. Daily services and needs seemed to be met easily: there were seven communal kitchens, regular water and propane delivery, trash pick up and porta-potty servicing. Regular meetings and trainings helped integrate newcomers and set strategy. We attended an in-depth orientation on our first morning, and a direct-action training in the afternoon. There were daily meetings on decolonization as well as political action strategy. The many types and levels of collaboration and coordination were incredible, all without money or hierarchy. As importantly, ceremony infused the camp. Every morning people gathered at the sacred fire, and then went to the river’s edge for a prayer and blessing led by native women. The sacred fires were always burning, and native people from all over the world came to offer their prayers and songs to the community. The orientation and action training talked through each of the seven Lakota values (prayer, respect, compassion, honesty, generosity, humility, wisdom) and centered ceremony, respectively. Being in such a space brought a sense of relief, and a feeling of how beautiful communal life could be, especially when compared to the daily lives of most people in today’s American society. As I was witnessing an alternative way of being in community, I was simultaneously ever aware that we were in a war zone. Police in riot gear lined the top of Turtle Island, literally standing on a sacred burial ground of the Lakota Sioux. Police floodlights lit the camp at all hours. A plane circled overhead most of the time — some people feared that it was spraying chemicals, others felt it was just there as an intimidation tactic. I’ve since read reports it was part of the efforts to jam cell signals and thwart the water protectors’ efforts to get their message out to the world. Especially after witnessing the brutal tactics of November 20th, their constant presence brought a sense of dis-ease. And of course, that was the point. There is so much we can do. Thankfully, my answer to that question has changed somewhat, thanks to the very welcome news from the Army Corps of Engineers . Yet Standing Rock has never been about one pipeline — it has also been about indigenous peoples’ rights in this country, the right to clean water, and the urgent need to transition away from fossil fuels. 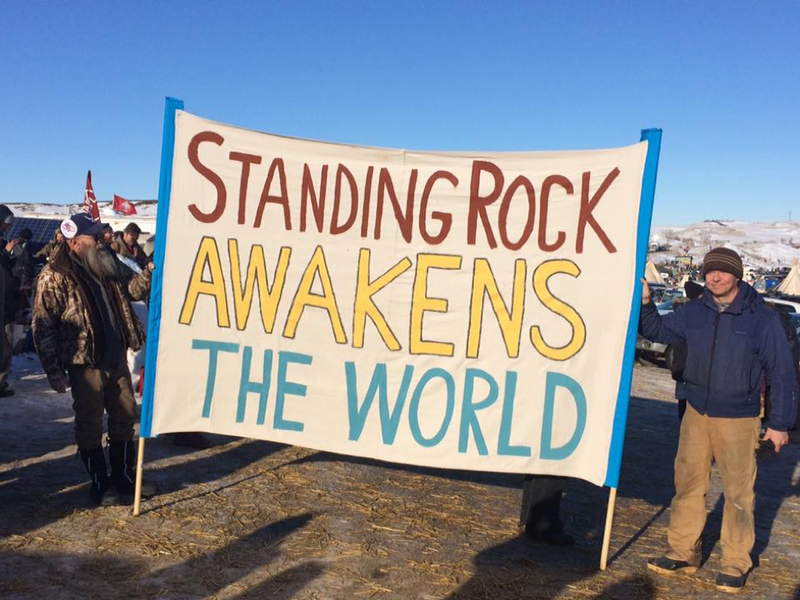 While fulfilling an ancient prophesy and drawing on beliefs and strategies from generations past, what has happened at Standing Rock is also something completely new. With that, here are some of my thoughts about what we can do from here, collectively and individually. 1. Solidify this win: It is important to remember that while this win is certainly significant, it is neither permanent nor guaranteed. The water protectors and all of their allies will need to keep the pressure up and stay informed of the process so the Dakota Access Pipeline is indeed stopped once and for all. 2. Protect other waters: People who were water protectors in North Dakota can take this purpose back to their homes, where undoubtedly there is water in need of protection. There were signs around Oceti Sakowin that said “Don’t like the cold? Come fight the Sabal Trail pipeline in Florida!” People are galvanized and awareness is heightened thanks to Standing Rock — we can leverage that to secure other wins against other destructive, extractive projects that threaten people’s rights and environment. 3. Learn from this template: Indigenous leadership provided a powerful template of prayerful, peaceful resistance that we all can and should learn from. Our successes in a just transition require us to lead with love. Standing Rock and Black Lives Matter are paving the way for stronger methods of working for social change: grounded in compassion; understanding intersectionality; and centering marginalized voices and leadership. 4. Be courageous: The new era in America — and the world — is calling on each of us to have hope and take action. This is the time to push to our edges and out of our comfort zones. It is the time to be more visible and vocal for our rights than we ever have, before they are gone. It is time to be protectors of nature, and each other, in the face of forces that would happily destroy what we love most dearly for greed and profit. Find your access, leverage, and contribution, whatever it might be. Do more than you have asked yourself to do before. Find community to do it with, and for. For me, this means stepping up my leadership of the Board of the International Accountability Project, a human rights advocacy organization that seeks to prevent projects around the world — like the Dakota Access Pipeline — from trampling on the rights of local and indigenous communities. It also means being MUCH more engaged and vocal in fighting for social justice and human rights here in the US by holding my government accountable. Lastly, it means creating and maintaining a loving, supportive community with others who are willing to stand up for rights and justice. Rachel Humphrey is a Program Director at the Bay Area Justice Funders Network and serves as Board Chair for the International Accountability Project.